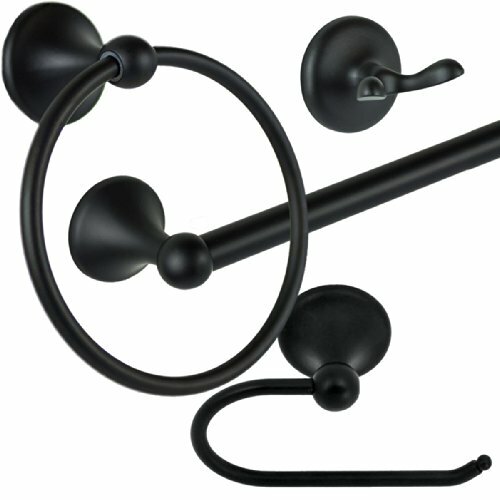 Burton Harbor's 4 Piece Bathroom Hardware Bath Accessory Set with 18" Towel Bar and Euro Toilet Paper Holder in Matte Black comes with everything you need to transform the look of your bathroom at a great value. The set includes an 18" towel bar, Euro-style single post toilet paper holder, towel ring, and double robe hook. This bathroom accessory set is both decorative and functional, with electroplated zinc alloy and aluminum construction. The posts are durable with sturdy bars and rings, and feature concealed screws for added beauty. This four-piece set has a protective coating to aid in the duration of the finish. The towel ring and towel bar help dry your functional towels or add a pop of color to your bathroom with decorative ones. The robe hook helps eliminate clutter by keeping towels and robes off the ground. The single post Euro-style toilet paper holder keeps the toilet paper within reach and changing the roll a breeze. For easy installation, all mounting hardware is included. If you have any questions about this product by Burton Harbor, contact us by completing and submitting the form below. If you are looking for a specif part number, please include it with your message.